When and what: Find out when the tests will be given. Find out exactly the consequences of refusing the tests. Put it in writing: Print out the form below or make your own refusal letter (there are lots of letters at www.unitedoptout.com you can use for ideas). Make at least 3 copies of your refusal form/letter, sign and date them, and send them to your child's teacher and principal. Your child should also keep an extra copy with him just in case the letter gets "lost" or there are different test administrators. Talk to your kids: Tell your children why they will not be testing and what to expect. It is a good idea to also discuss what to do if teachers or administrators get pushy trying to make them test (see our Student Pages for more info). You may be lucky and have a sympathetic test administrator or be in a school district that easily allows students to read a book, do an alternate assignment, or go to another classroom during testing. But some districts have threatened that students who do not test must sit quietly with nothing to do during the entire test (that is called "Sit and Stare"). If that is the case, point out that the TNReady testing manual clearly clearly states students may read or do an alternate activity not related to the tested subject (Click HERE to see and/or download the testing manual. Page 22 is where it says, "If a student finishes testing prior to the scheduled time, they may do quiet academic activities that are not related to the content area being tested."). Tell them you expect your child to be allowed to do that during the test. No matter what, students should remain calm and polite, and should not get into trouble by being rude or disrespectful. Students should not answer any answers to any questions on the test, not even to bubble in their name or click "Exit" on the screen, doing so could affect their score and their teacher's evaluation. Make a plan: Some parents do not want their child to be forced to sit quietly for 8-12 hours of testing, so they choose to keep them home or schedule dentist, eye, doctor checkups, etc. during the testing. That is a decision you will need to make and communicate with your child. If your child does not go to school during the testing, be sure to ask when the testing make-up dates will be because your child will most likely be offered the test when he/she returns to school. It is best to know in advance, and having that information in writing from your teacher/principal/district is wise to avoid miscommunication. Here's what will probably happen: You'll get a memo forwarded to you from Christy Ballard at the TDOE from April 2015. This memo is a way to bully parents into not refusing/opting-out of the test. 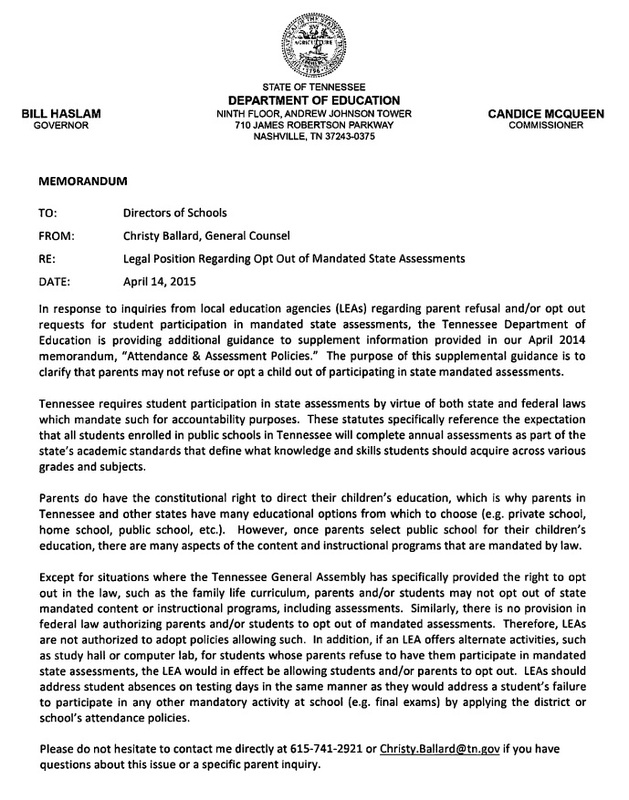 The memo says there is no Opt-Out Law in TN. However, it is important to know that there is no law stating that children must take the test, either. They can't force students to take a test. So, don't let that memo discourage you. Stay strong and do what you know is best for your children. No matter what, remember your manners: Teachers and administrators have no choice and must give the tests. They'd most likely lose their jobs if they didn't. Your school district would lose funding (but nobody really can tell us how much) if they didn't give these tests. Many teachers are just as frustrated as you are, so please be kind to them. Don't blame them for this mess. Tell us how it went: Let Momma Bears know how it went! We are trying to keep track of test refusals in Tennessee. We might be able to use your words and experience to help others. We would be grateful if you would complete this anonymous survey for us (survey is at the bottom of that webpage). Thanks! Talk to your elected officials: Tell them why you are refusing the test and why they need change the policies and laws mandating these tests. Visit our Advocacy Page for tips on how to get your message across to them. This really is a super-important step, so please don't skip it, Momma Bears. Have questions??? Visit our FAQ section by clicking HERE.